Today two presentations will be given on two different but complementary projects to unlock not only Auckland but the Upper North Island. The first presentation to the Planning Committee will be mine on the importance of having the Southern Airport Line built as soon as possible. The second presentation is from Harriet – Greater Auckland on Regional Rapid Rail (Auckland to Hamilton and Tauranga inter city rail). Both schemes while different complement each other highly. The Southern Airport Line is a rapid transit link between Botany, Manukau and Puhinui Station to Auckland International Airport while Regional Rapid Rail links Auckland to Hamilton, Tauranga, Rotorua, Cambridge and Te Kuiti. You notice the Southern Airport Line and Regional Rapid rail intersect each other at Puhinui Station. While RRR opens Auckland up better to the upper North Island the Southern Airport Line opens up Auckland Airport to the Upper North Island meaning you wouldn’t need to drive to the Airport and battle traffic. So if you were in Tauranga and needing to fly out of Auckland you could catch a train at Tauranga to Puhinui Station before transferring over to a Light Rail unit to complete the trip to the Airport. Total trip time should be around two hours or less depending if Stage 2 or 3 was implemented. 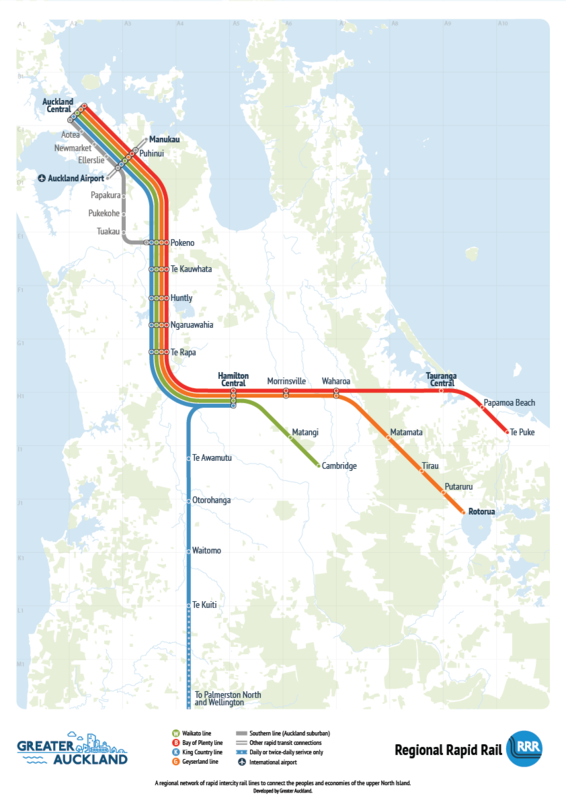 Trains to Planes, and opening up Southern and South East Auckland with Regional Rapid Rail and the Southern Airport Line.